Too big for your old Big Wheel? 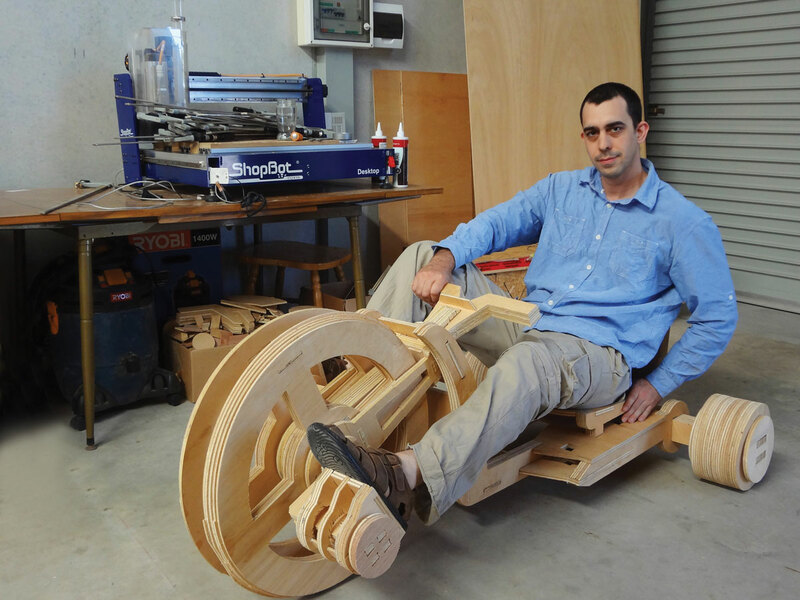 Get back in the race by building an adult-sized trike from plywood. Jon Cantin, a self-taught designer in Perth, Australia with a passion for CNC fabrication, scaled up the classic kid mobile’s design to fit his frame and support his weight. “I want this to be strong, functional, and cool!” The finished project, about 5 feet long by 3 feet wide, uses no hardware — only “a herd of cattle hooves worth of glue” — to assemble its 237 parts cut from 10 sheets of plywood. Cantin tinkered through design challenges using mental calculations and Autodesk software so he would only have to build the trike once. As his ShopBot Desktop CNC router limited the size of pieces he could cut, the design incorporates overlapping tiles so the front wheel could live up to its big title. In a series of posts on his website, Cantin talks through the thought processes behind the design, the challenges of building it, and what could be improved next time. The site sells plans for this and other rad projects and freely offers advice and inspiration about CNC skills and entrepreneurship.